The Samsung Galaxy A8 delivers some of the best bits of the Galaxy S range, at a more affordable price.In my Samsung Galaxy A8 review, I take a look at this superb smartphone. The Samsung Galaxy A8 has an Infinity Display, this 5.6-inch Super AMOLED screen is superb for watching videos with the 18:5:9 screen aspect ratio. 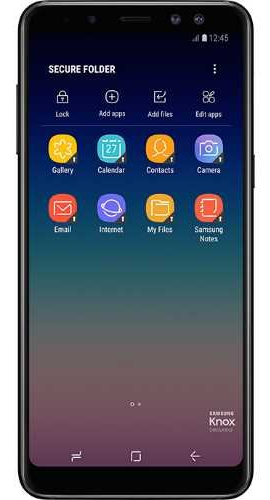 The Galaxy A8 has the Always on Display, you get to see the time and notifications without having to keep waking up the device. The phone has an aluminium frame and the front and back are covered with smooth, cool glass. The phone feels like a good quality, sturdy smartphone. The Galaxy A8 is water resistant and dust resistant, the phone is available in black, grey, gold and blue. The big, beautiful display wakes up using facial recognition or with a scan of your fingerprint. The fingerprint sensor is on the back of the phone, a much more natural placement for picking up and easily unlocking it. The fingerprint can also be used to open the Secure folder, here you can keep important documents or apps for your eyes only. Bixby is on board the Galaxy A8, this digital assistant can glean information from your photos or texts to bring up relevant web results.It can also set reminders and create messages using voice commands. Android 7.1is on board and this is complemented with the Samsung Experience 8.5 overlay, as seen on the Note 8 and Galaxy S8. This gives you various features that work alongside the Android OS, such as Dual Messenger for having two message accounts. The Experience also uses Adaptive Wi-fi to remember where you have connected before and automatically connect when in range. The system will switch off Wi-Fi when you move out of range to save battery life. The Samsung Galaxy A8 has fast charge for getting the 3,000mAh battery to full power in quick time. The battery offers up plenty of use before needing to be charged. You should get around 24 hours of talk time of 15 hours of internet browsing. The selfie camera gets a big boost with a dual lens configuration for effects like bokeh in real time. The camera is a 16-megapixel and 8-megapixel lens package. There are lots of effects for creating the perfect selfie with Beauty effect, Wide selfie and Live stickers. The video capture on the front camera can use the beauty mode too as well as voice control and HDR capture. The rear camera is a 16-megapixel lens with an improved low light capture and many shooting modes to suit your subject, Food mode will capture your meal perfectly or you can select Pro mode to adjust settings like a professional photographer. Other shooting modes include Panorama, HDR, Hyperlapse and Sports mode for capturing moving objects. The quality of the Samsung Galaxy A8 is superb, you get a lot of the top features that are on the more expensive Samsung Galaxy S8. The selfie camera is fantastic which will appeal to many people and the user experience is superb as you would expect from Samsung. If you want the best Samsung experience but don’t want to pay the top Galaxy S8 price, the Galaxy A8 is a perfect choice.